i use the product in my car,it helps my back while driving or in passenger seat. Bought one for my car. Husband tried it & had to get one for his car. Sister-in-Law liked it & got one for her, Brother-in-Law liked it & got one for him. I bought another for me to use on certain chairs in my house. Only have had the one for my car about three months. So far it's holding up good. It support your back really well makes you sit up straight and no slouching when driving. The auto seat cushions are great for covering up worn spots in my original leather seats in my car. I bought this product because my car seats are cloth and after having back surgery it was hard to get in and out of my car, but after buying this I can now get in my car the right way and there is no strain on my back! I love it on the mobilized wheelchair. One can slip-on and off the wheelchair with ease. You can easily reposition your sitting-posture also with ease, and the lumbar support is of great value. Plus, the leather helps prevent status cling with your clothes, not to mention keeps your body's temperature cooler. This product is idea for any sitting! Perfect for me. Not too bulky. Very comfortable. Has not negatively affected my personal temperature. I used the lumbar cushion seat in my car, and it looks great, feels great,and I purchased it for a great price. It also cleans good. I am very satisfied with this product and wish it came in other colors. For back issue. It feels Awesome. Everything is Awesome! Easy to get into and out of the car seat because it is a leather or leather like product. I feel it is very practical, very happy with the product. Don't let aches/pains keep you home! I am 86, suffer from arthritis/osteoporosis but am still driving and make occasional trips from Canton, OH to St Albans, WV. They get more and more tiring as I age. I purchased your leather lumbar cushion for my most recent trip and never enjoyed the trip more. disabilities. Wish I had purchased it sooner! Love my new car seat cushions! The quality is good and they more than met my expectations! I am in LOVE with this cushion! This is my 3rd set...I am stock piling because I'm afraid MK won't offer much longer. Leather wears great...one set a year old and no breakdown yet. Can't beat the price!!! It answered the problem to my lumbar discomfort in our new Jeep Wrangler, which I love too!!! I would buy this product for any car I ever own. the cushion looks great in my Chrysler 300 and it matches color wise and feels real good to sit on and is very comfortable. I order this for my husband. He said its doin its job pretty good, it helps him with his back when he's driving. I use it in my car for comfort and to add height to my "shortness" - it's well made. Iam using this in a power recliner that was very uncomfortable. It has made a considerable difference. I highly recommend it. Whenever I got into the car with our microfiber seat, it was difficult to slide in and out of the car; now it's very easy using the leather seat cover. I use this cushion for myself in the car. It is so comfortable and my back feels good. I am handicapped and I have trouble getting into my van as it is very high this helps me to slide into the seat more easily. I have cloth upholstery in my van and without this cushion it was a real struggle to get into the vehicle. It would cause me a lot of physical pain. with the cushion it is so much easier and a lot less painful. Allows my wife to rise up in the driver's seat and more comfortably drive. wider view. I bought this cushion to make me more comfortable when I drive. I'm handicapped & this cushion gives me the support I need & it helps me get into proper driving position. I love the lumbar cushion so much i ordered another one. I bought these chair pads for my dining room chairs. they are very comfortable, clean up well when something spills and will not use their shape! Try them this way, you'll love it!!! I am not using this in a vehicle but as my TV viewing seat. It fits nicely on my sofa and serves the purpose. We use them in new car that seats don'the slide easily.works great in protecting seats as well. Bought two before and just ordered two new ones for spares. You slide into the car easier. I have short legs and sometimes it is hard to get into a car. I use one on each front seat in my car. I like to be able to slide in and adjust myself which I was unable to do with my fabric seats. Also if I spill a crumb or something it will not stain. I found this item to be very comfortable for my back,and also for sitting long periods of time. Definitely would purchase again. This fits perfectly in the car. My son has cerebral palsy and this car seat cushion has the perfect comfort for him. Thanks. I use the lumber seating for my back, and buttocks for support, because the seats in my car are not very comfortable. I would have preferred grey rather than black to enhance the look of my interior car. I love this car lumbar support cushion. I am elevated in the seat just-enough to see over the hood of my car better. I have a nice car but on long rides it is difficult for me to drive for hours...with the addition of the lumbar cushion on my seat, along with seat adjustment, I can drive many hours without the discomfort on my usual trips....and I have tried many cushions. One big plus is the fact it has two black bands for securing it in place. No more falling on ground in the rain...it stays in place....thank you. My new wheelchair was so very uncomfortable. With this lumbar support I can sit in it all day long. I don't have time..it is just great for lumbar spine!!! they look very good in the car they and they improve my posture and help my bad back. Helps with back comfort on long trips. Use for my car seats for comfort ride. So far not back for anyone with a lower back problem.....try it. Easy return by friendly customer service personel. I placed the leather lumbar cushions in the 2 front seats of my vehicle. They make entrance and exits much easier as well as give me back support and protect my cloth seats in the car. I am very pleased with them. I use this in recliners to keep from sinking at the back of the seat, and, on my medical scooter for extra padding. I no longer drive a car due to the cost involved now days. This is my second or third one of these, wore out the others over the years. I put off ordering this for too long. Now I don't have to use the lint roller every time I get out of the seat. This looks good, makes it easier to get in and out of the car. Seems to be holing up well. I mostly use it in my recliner, it is great.I am going through therapy on my back and this really helps. I was pleased with my seat but my husband has ripped his elastic straps off from use. I put this in my GMC Sierra truck to protect my seat. I had no idea it would be so comfortable. I am really enjoying it so far. Being disabled by a stroke 9yrs ago it is a great help getting in and out of the car with fabric bucket seats that prevent easy movement. Still using the first one purchased more than a few years ago. Needed more cushion in the CR_V seats.So inexpensive I ordered two. Glad I saw this in the catalog. Got one for my husband for his truck seat. He thought I should get one so that his truck seats would match and it would help me getting in and out of the truck as I am able to slide on these rather than the cloth seat covers. We really like the product and plan to order another for the other seat It seems to stay in place better than other products we have had. This is a comfortable and nice looking seat insert. It stays in place when getting in or out. I changed cars and lost my leather seats. I bought 2 of these seats to get the feel of leather again. It is not the same thing but it is a lot better than cloth seats. Great buy and very practical. Bought it as a replacement for one that was 12 years old. Husband was really happy to get it for Christmas. Very nice, hopefully it will hold up as long as the old one. Bought to replace old cushions. Only bad thing the mothbal smell. Took about a week to get rid of it. I put them out on the closeline before putting them in the car. Used in car. Helps keep seats protected. The seat cousion is of good quality,heavy, leatherlike material. Has a little strong odor about it at first. This has been in my desk chair since I bought it several months ago. It's still exactly the same after sitting on it from eight to sixteen hours every single day. I'm much more comfortable because it fits my back better than the expensive desk chair does. When driving a long distance, it helps relieve back stress and strain. Adds comfort to driving. Cushion is comfortable but arrived with a very strong, musty smell as if it had been stored in a damp warehouse. We masked odor with a hanging car scent. Needed something to raise the car seat for 5 foot female and the bottom of cushion is not very deep. Had to put another cushion under this one to raise it. I do like the product and the price. It is an exceptional value! I wojld buy this item again. The product is fine the only draw back is when you enter the car the seat cushion moves around a lot and must be manually replaced. Comfy and makes a difference in lower back and backside :-) comfort. Would give 5 stars if it had just a bit more cushion. When I first opened the box with the lumbar cushion the odor was so strong that I had to leave it out in the air a few days before I could even consider putting it in the car. I did eventually put it in the car and got used to it. I think it helps on my drive to work and back each day. It seems to relieve pressure on my back from the drive. I purchased this cushion on sale. It does the trick for lumbar support, but I don't think it is worth more than I paid for it. Also, the tear in the leather that was present upon arrival was not too appealing. The leather is good. The real problem is the poorly constructed elastic straps. The top ones slip up to the head rest. The middle ones are okay, the bottom ones are supposed to hold the seat in place but the hooks are too small and constructed of a thin plastic; also the elastic straps are very small and of poor quality. In my car there is nothing small enough to hook them on so I had to add a better hook. Also the seat part should be a lot thicker and denser foam. Using it In the house on a chair. Easy to clean, wipe off, etc. strap has already broken off, had to reset it back. I like the extra feeling of support in using a seat cushion set on top of the regular car seat. We just got a new Jetta with black leatherette interior and the black leather cushion works well aesthetically. It is a bit flimsy and the leather and fabrication odors are noticable--but will, I suppose, wear off. It has 2 straps that fit over the back of the seat and a couple of small straps for underneath. It is not perfectly secure but is O.K. I will continue to use it at least off and on. My wife doesn't like any seat cushion so when she drives she takes it out. Overall it is an O.K. seat cushion. I'm not sorry that I got it. And it was inexpensive. This cushion looked soft and cushiony, but it looks dull and it is stiff. It does provide some comfort for the back, but it does slide around a bit in the seat. I just got it, so hopefully I can break it in a bit. It looks nice in the seat. Problem with trying to keep it in place even though it does have straps to go over the real seat. Needs more padding real bad. I would not buy another one.. about the only good thing I do like is the fact it makes it easy to get in and out of the car because, I have cloth seats and this is slick and I can slide out ease with this. Husband drives a lot for work, needs comfort & support for back. Looked forward to getting the cushions but disappointed that they arrived torn. I had to add rubber under the cushion to keep it from sliding each time I get out. Needs readjustment each time you sit. Causes stress doesn't eliminate it. These cushions have the most terrible smell. I sent them back for a refund, and the smell is still in my car. The leather in these seat cushions smelled so bad I had to take them out of my car. The smell made us sick. I wish I would have saved the the invoice. I would have definately sent them back. The pinnapple corer did not work either so I will never order from your catalog again and will warn others about your products too. This thing was so smelly it took 3 weeks to air out....had to leave it outdoors...it smelled like it was mildewed :/ It is really thin & offers absolutely no lumbar support what so ever. Total waste of money. Very cheap and flimsy. Straps already came unthreaded. Not very pleased with this item. It is very hard and has a horrible odor like it has been in a musty basement. Perhaps it's a "pleather" smell, definitely not leather, but it is not like the one that I had previously. Would not recommend. This product is the worst item I have ever received thru any catalog. It's called a "cushion" but there is no cushioning whatsoever. You might as well sit on a rock for all the comfort you DON'T get from this product. Total Disappointment!!!!!! very disappointed in the quality. I sent it back. Put it in golf cart for lack of anything better to use it on. Odor was bad enough to not use in car. Applied leather conditioner. Put into truck that I only dtive. I was hoping it would help my back while I drive. It moves around and is very thin, not helpful at all. waist oif money. I am a bus driver and I usually buy these cushions, but they are not durable after a while they sometime burst open on the side, or it get very weak or lose that it will not stay up in your seat. Very poor quality, but I have no other choice, continue to buy. because it better then sating in the bus seat where millions of drivers interchange daily. Additional comfort in car, hopefully. Comfort and protect my seats. Do to my back I wanted something that would help my back when I am in the car or truck. Purchased one already for the driver's side; decided to get one for the passenger side as well. Works well in the van. More comfort while driving and protecting seats. Hope it will help with lower back support on trips. My husband needs the extra support of this cushion when he is driving. Looks comfortable for our car. I sit a lot and I need the support. cloth seats make it hard to slide into the van, so here is hoping that this will solve the problem. TO protect my seat car from fading and tearing. In addition my car seat is to large for my body size. I think this car seat will help me a little bit. I recently bought a " new " older car, a 2001 Buick Century. I looked for front seat covers to protect the cloth seats and found this was going to be difficult because of the extended driver' s seat, compared to a regular bucket seat on the passenger side. These leather cushions with straps should fit OK and serve my intended purpose. I hope I will be pleased ! My husband loves this for his back. He uses it in his truck and it keeps his back from aching. because of back problems I hope this will help me to get in and out of my husbands car. I need more back and seat support when I am in my van. this will be my second one and I have been well pleased with it. I need something like that on my car. I have back issues. I am hoping the lumbar will help when I travel. For back support while driving. My friend has something similar to these and I'm going on a long trip this summer. I will need the extra comfort. Hoping they will protect my seats. looks good and I need the support. I deal with very high back pain, hoping it will make my drive or ride more comfortable. To protect my seats and also it added just enough height to help me see better while driving. What colors do you have for this seat cushion? BEST ANSWER: Thank you for your question. This item only comes in the color Black. We hope this information will be of help to you. do you have this seat cushion in brown? BEST ANSWER: Thank you for your question. 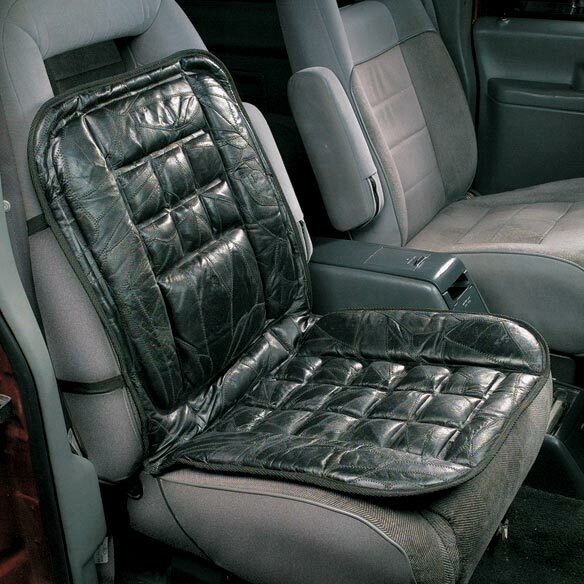 Unfortunately, we do not offer the Lumbar Cushion For Car in Brown we only carry it in the black as pictured. We hope this information will be of help to you. will this seat cushion support back pain? BEST ANSWER: Actually I thought it would but it really doesn't. If the seat is lined up correctly in the car, it helps a bit, but the cushion moves because the elastics holding are not very strong. The cushion needs to be pushed all the way into the rear part of the car seat and it helps a bit, but it moves as soon as you get in. I purchased this seat cushion because it has a smooth leather surface making it easier for my 94-year-old husband to slide onto when getting in our car. It is a comfortable seat cushion that, at least, is okay for my husband's back. I would not expect it to actually relieve back pain. Makes it much easier for my husband to slide in or out of the car. We've been using it for several months and still looks good and functions as expected. I have sciatica in the low back and I find I am more comfortable with this lumbar cushion. It has helped me.